Whether you work in an office or from home there’s a good chance that you spend a significant portion of your day staring at a screen of some sort. We all know we should take regular breaks, but sometimes having a busy job means we can’t step away from our desks as often as we should. In this article we explore the effect of display screen equipment on health. The laws surrounding display screen equipment use apply to everyone who uses such equipment ‘as a significant part of their normal work’ (Health and Safety (Display Screen Equipment) Regulations 1992). Interestingly, these regulations do not specify the length of breaks and do not limit the length of time a person can spend working at a screen. The best advice is to use your own judgment, taking short, regular breaks whenever you feel the need. So what are the risks to health associated with using display screen equipment? 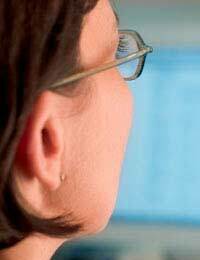 Perhaps the most common, noticeable after a long day, is eyestrain which may cause headaches. Maintaining a good posture may help to combat the pain many people feel in their shoulders, neck, arms and hands; so ensure that your chair and desk are set up correctly. Tiredness and anxiety can also result from long term use of display screen equipment, particularly if you constantly juggle an overflowing inbox. Correct positioning of display screen equipment is key to comfortable, healthy working. By ensuring that your chair, desk and screen are in the right position you may be able to prevent long term health complications. Your health and safety representative will be able to help with this, so do take advantage of their knowledge. If you use a laptop, get into the habit of using a docking station – you’ll save yourself a lot of discomfort this way. Protecting your eyesight is critical, so make sure your screen is comfortably visible and that there’s no reflected light causing you to squint. If you use display screen equipment for a significant part of the day you can request a free eye test from your employer. Should the test recommend that you use glasses for screen work only, you employer is required to contribute a certain amount towards their purchase. This is a great benefit, so take advantage of it! Your employer should make you aware of the recommendations concerning display screen equipment use, and regular assessments should be carried out, particularly when desk moves occur, or when new starters commence employment. Training around posture, breaks and free eye test benefits should be made available to every employee, so ask your employer about the arrangements in place in your workplace. Even if you don’t feel any ill effects from working with display screen equipment, it’s a good idea to seek advice to ensure that you don’t fall into bad habits. However busy your role, remember that your health and safety is your number one concern!